Californians love spending time on the water, it’s one of the many joys of living near the Pacific Ocean. As fun as boating is, cleaning a boat is a whole other story. Marine vessels are exposed to harsh elements. Salt water, barnacles, algae and fishing debris all contribute to paint damage and a dirty boat. Ceramic Pro San Diego offers several services to keep your boat in prime condition. We can fully detail your boat and can also protect it with Ceramic Pro Marine nano-ceramic coating. Ceramic Pro Marine provides protection to the boat’s exterior, both above and below the waterline. It is an extremely durable, protective coating with a hydrophobic finish. The slick finish below the waterline helps prevent barnacles and other sea creatures from sticking to it and helps to preserve the paint. Above the water line, water will bead off your boat and cleaning it will be a breeze. Weather you have a jet ski, fishing boat, speed boat or yacht, Ceramic Pro Marine will improve the longevity of your vessel and keep it looking sharp. Ceramic Pro Marine is the worlds first all inclusive preventative maintenance product line specially designed for professionals. 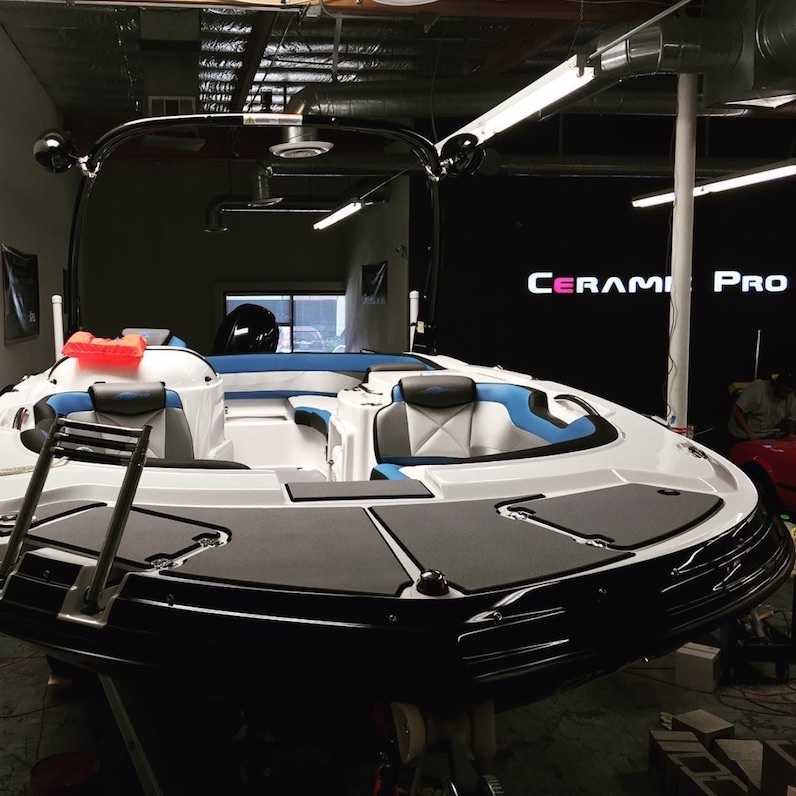 Our specialized application centers enables trained and certified professional installers to Apply Ceramic Pro Marine to all surfaces on your boat. Ceramic Pro Marines cutting edge protective technology is the common sense choice in an industry where boat stands for “Bust Out Another Thousand”. Stop spending thousands of dollars on aftercare. Our products can not be washed away or removed thru environmental hazards. Ceramic Pro Marine is suitable in the most extreme environments from the frozen seas of the arctic to the sun damaging effects of the equator. Ceramic Pro Marine is the most versatile coating on the planet. With its wide rang of uses there is literally no surface on your boat that can be left unprotected. We have chosen to provide proven warranties over “peace of mind” warranties because we believe your experience with ceramic pro marine should be the same on day one as it is years down the line. Ceramic Pro Marines protective layer reduces the surface tension of any surface allowing bird/bug dropping, fish blood, oil and any other contaminants to be easily washed away. Say good bye to harsh chemicals and time consuming washes. Is Ceramic Pro Marine Safe for my paint or gelcoat? Does Ceramic Pro Marine crack, peel or yellow? No Ceramic Pro Marine will not Crack, Peel or Yellow. Our products have undergone SGS testing and real life testing in some of the worlds harshest environments, and surpassed every one of them. Is Ceramic Pro Safe for all surfaces on by boat? Yes, One of the great properties of Ceramic Pro Marine is its versatility and its ability to protect any surface you choose. Is Ceramic Pro an alternative to anti-fouling paint? Can I apply Ceramic Pro Marine products myself? Ceramic Pro Marine can be applied to what part of my vessel? My boat has pre-existing damage, can Ceramic Pro Marine be applied over this? No, Our Trained and Certified professionals are experts in the art of surface correction. Our professionals will restore your boat to the absolute best condition they can prior to Ceramic Pro Marine application. Can Ceramic Pro Marine products be used on my isinglass? Yes, the complete line of Ceramic Pro Marine products are completely versatile and all carry UV inhibitors that will protect your isinglass from UV damage that causes them to yellow and crack. Ceramic Pro Marine products also offer a self-cleaning effect that not only make cleanings easier but also reduces the need to carry an entire array of cleaning products. Say good by to your plexi/isinglass cleaners. Will Ceramic Pro Marine protect my vinyl? Yes, Ceramic Pro Marine will protect your vinyl from accidental spills, fish blood, stains, oil/grime and harmful UV Rays. Ceramic Pro Marine is completely flexible and will not crack or peel from your vinyl. As with all surfaces, Ceramic Pro Marine offers a self-cleaning effect allowing your vinyl to be easily cleaned. Say goodbye to countless vinyl cleaning agents. Will Ceramic Pro Marine Prevent water spots? No, Ceramic Pro Marine will not prevent water spotting but it WILL allow those pesky waterspots to be easily removed without damaging the surface. Because Ceramic Pro Marine creates a protective layer over the substrate it does not allow the minerals to corrode or etch the surface that Ceramic Pro Marine is protecting prolonging the life of your metals, paints, gelcoat, plastics, vinyls etc. Will Ceramic Pro Marine protect by metals on my boat? Yes, Ceramic Pro Marine does an excellent job protecting your metals above and below the water from corrosion, water spot etching, oxidation and discoloration. Ceramic Pro Marines self cleaning effect also makes maintenance a breeze. No need to continuously polish your brightwork to keep its original luster. Does Ceramic Pro Marine effect the walkability of my nonskid or teak? Will Ceramic Pro Marine protect my teak? Yes Ceramic Pro Marine will protect your teak from accidental spills, staining, mold growth and rot. Ceramic Pro Marine enhances the natural look of the wood and alleviates the need for oiling of any kind. How long will Ceramic Pro Marine Last? Ceramic Pro Marine has a 3 year proven lifespan. That’s longer than any was or sealant on the market! Can Ceramic Pro Marine be easily removed? No, Ceramic Pro Marine cannot be washed away like a wax or sealant giving it long lasting results. You must polish to remove Ceramic Pro Marine. Do I still have to use a bunch of chemicals to clean and maintain my boat? NO!!! That’s the great thing about Ceramic Pro Marine Products. Water and a mild boat or dish soap will do the trick. Good bye bleaches, glass cleaners, vinyl cleaners, metal polishes etc. Do I need to wax my boat after Ceramic Pro Marine products have been applied? Can I use a pressure washer to clean my boat? Do I need to polish my boat every year? No!!! Ceramic Pro Marine Products eliminate the need for annual polishing due to its protective value. Stop spending thousands on after care and start investing in preventative protection! Can I use a deck brush to clean my boat? No, the only requirement to keep your warranty valid is to have our Trained and Certified Professionals to perform an annual inspection to ensure the coating is performing as it should. Often times a complimentary wash is provided at this time.